Custom Logo Design. 100% Guaranteed! Start Now! Welcome to our Logo Design Section! Every business needs an identity. Apexity designers have the talent and experience to deliver exactly the image you want. We will give you that professional and trustworthy look and feel for a very reasonable price. We don't limit you in any way while designing your logo and stationery. Choose from as many design ideas as it is necessary, pick as many colors as you like, request any changes you want, and get any formats you need. There's no extra charge, no matter how many mockups, colors, modifications or formats you want! 100% unique - No Clip Art. Superior quality - unlimited designs and changes until you are happy. Affordable - no extra charges or hidden fees, guaranteed. Fast - swift 3-day turn-around. 100% risk-free - customer satisfaction guarantee. Whatever your design needs are, from a logo to a website, or from a print ad to an animation, we can certainly handle it for you. We are eager and excited to get down to work. Our convenient Online Order Form will allow you to start your logo project. Tell us about your company, your services, and customers. Let us know your logo suggestions and design preferences. 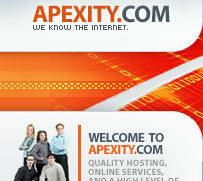 Your securely processed payment will allow the Apexity team to start designing your new corporate logo. You will hear from us in just a few hours.